A few things to note about this beer... 1) it's from Bear Republic Brewery out of California. These guys do the hoppy beers really well and it shows, as of the 73 beers they have listed 12 are IPAs and 7 are imperial IPAs plus some hoppy APAs and other styles mixed in! 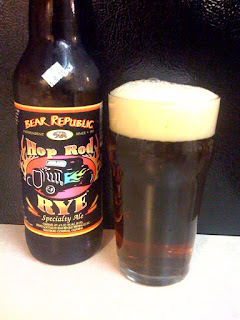 2) It's called Hop Rod Rye for a reason, so if you're not a fan of the hops, might be time to click over on right side of this blog and find a different beer as you probably won't want to look for this one! If you're a fan of the hops though, check out Calandro's for this one and others from Bear Republic and you probably won't be disappointed. Now, on to the beer... it had a very creamy head that lingered forever it seemed, it took several pours to top off the pint glass and a couple of pint glasses to wipe out the 22 oz. bottle. 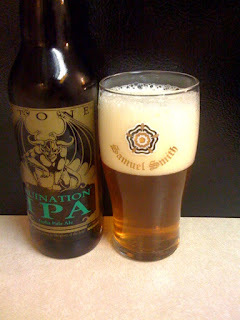 A definite aroma of hops, wow, STRONG with some hints of pine and citrus. The 80 IBUs this beer boasts come through right away, really inviting a sip. The taste is overwhelming on this one... overbearing hops and bitterness, but the other flavors shine through. The more I drank, the better it got and the more I could taste the caramel malt and rye flavors present. Definitely not a beer to start out the night with, but after I got the taste buds warmed up I really enjoyed it. I know a few friends of mine like the hoppier beers even more than I do (Andrew, Dustin, talking to you two!) and I'm sure this would be right up their alley. Check it out if you want to test the limits of how hoppy you like your beers! For a slightly less bitter IPA from these guys, a few places in town feature the Racer 5 IPA on tap, including the Chimes. It's one of my favorites to fall back on when the rotating taps don't spark my interest.